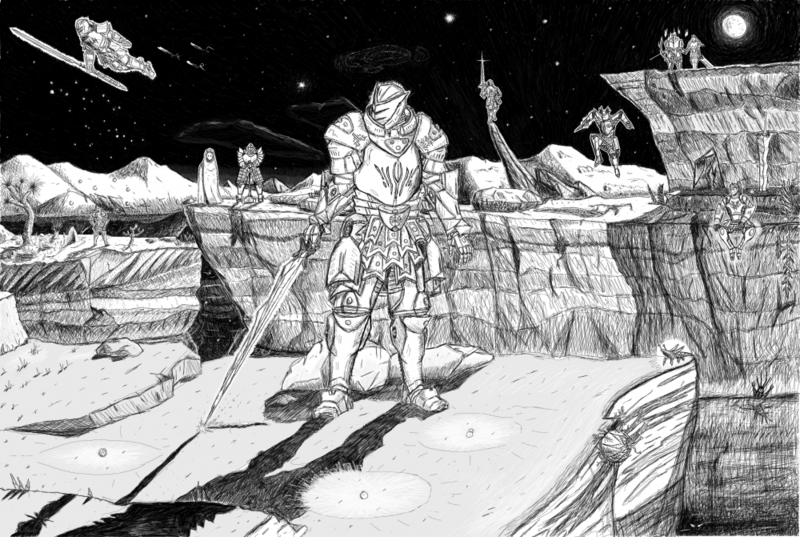 This recently rediscovered image is believed to be from the final days of the false desolation. This “Full Set” is perhaps the final strike team to be issued out of Urithiru before its abandonment. Consisting of one representative from each order of Surgebinders they were tasked with pursing escaping Parsh and what was at the time believed to be the last remaining Thunderclast into the broken ruins of Stormseat. Tensions between the orders were already apparently high at the time of their sending, regardless no one save the Bondsmith ever returned, and no other record of what they found or experienced exists today. That’s amazing! I love all the details you included like the glyphs on the Shardplate and the different radiants in the background. Feels very real. Thank you for noticing. I’m very detail oriented and since the actual illustration size is huge (much larger than would fit on a screen at full size) I was afraid many of the little details would be lost. These are the “secrets” the scholars notes refer to. At first, I thought it was a piece of official art commissioned for the 4th book that we got a preview of. it's really good. Wow, that’s a fantastic work. Quick question though. Which order is the cloaked figure in the middle of the upper left quadrant? Lightweaver. There’s a cryptic on the hem, and I guess that one soulcast so much they’ve started to look rather inhuman Underneath the cloak. Quick question: is that a Cryptic or a plant clinging to the wall level with the main Truthwatcher figure's hand, diagonal and to the left of the jumping/falling figure? It’s supposed to be an open vine bud like the closed one in the foreground. I rushed that one really bad. It looks good! I'm just not very good at distinguishing small stuff like that. Thank you very much. That was one of the last touches I added, and there are still several more Easter eggs that haven’t yet been noticed . Since I just finished this one after working on it on and off for so long I’m not really sure what to draw next. and is that a space whale I see? There’s a Knight right next to it. Not only that but it’s a very specific sword. (And the space whale is a hastily added cloud) - and if we’re really pulling hairs here why are ANY of their weapons out- why not spren floating next to them. Because swords are cool. Nope none of those. It’s fairly recognizable; in the official art of all 3 books. And... yeah. 2 clouds. Like I said. I added them towards the end when I just wanted the drawing to be done. I also think they look like rocks. That's Jezrien's Honorblade, I believe, judging from the ripples. I'm almost tempted to say Oathbringer as well, though. Am I correct on either count, @Braizier? Snap. I thought I had it with the Honorblade thing. 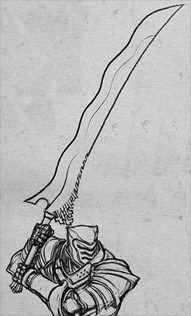 jezrians is probably the most frequently illustrated one though, and Honor blades have a notable history of being stabbed into the ground and left behind, but I really wanted to include at least one blade we had already seen in a pre recreance state. what about the thing above truth's head? It’s a concentration spren. Described in edgedancer as circular ripples in the air above people’s heads. It’s my theory that concentration spren will have a connection to truth watchers in the same way windspren are tied to wind runners, creation spren to light-weavers, and glory spren to bondsmiths.